NOTES: "Inlé", was created a group show curated by Greg Simkins, hosted by Gallery 1988, and featuring paintings inspired by the story "Watership Down", specifically, Inlé, the black rabbit that functions as a metaphor for death. For my contribution, I chose to focus around "Hazel", Watership's protagonist. In the story, Hazel gets shot in the leg, a wound that gravely effects our hero. 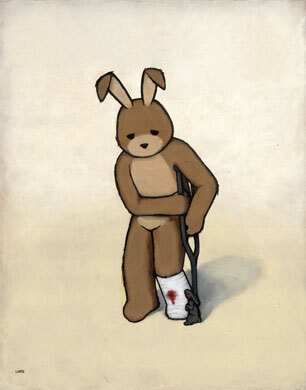 For my painting I chose to feature the wounded Hazel standing in crutches as Inlé, the black rabbit inspects the damage.